Last December 16th, Orbital Sciences Corporation launched the TacSat-2 microsatellite for the U.S. Air Force aboard a Minotaur I launch vehicle from NASAs Wallops Flight Facility. The client was the U.S.A.F.s Space and Missile Systems Center (SMC) Space Development and Test Wing (SDTW), located at Kirtland Air Force Base in New Mexico. Approximately 11 minutes after lift-off, the Minotaur rocket placed the TacSat-2 spacecraft into a low-altitude orbit. The rocket also deployed another microsatellite, GeneSat-1, for NASAs Ames Research Center. The TacSat-2 satellite demonstrates new technologies and capabilities for ORS support of military operations in the fact that there were multiple experiments on board the satellite. The primary experiment focused on a medium resolution imager, which demonstrated the ability to be autonomously tasked and rapidly provide data to warfighters on the ground. The TacSat-2 and 3 partnerships include space organizations from the Air Force, Army, and Navy. If youve never heard about Operationally Responsive Space (OSR), understand this is envisioned as a capability to assure space power focused on timely satisfaction of Joint Force Commanders needs. ORS is intended to make critical contributions in terms of reconstituting lost capabilities and to augment existing capabilities. In addition, OSR will exploit new technical and operational innovations as well as enhance survivability and deterrence. ORS will consist of spacecraft, launch vehicles, and ground segment to provide surge capability, reconstitute damaged or incapacitated satellites, or provide timely availability of tailored new capabilities. Each of the ORSSats and TacSats require an appropriate launch vehicle. In the near term, ORS is using the Minotaur launch vehicle from Orbital and the Falcon launch vehicle from SpaceX. Also being explored by ORS are responsive, economical launch vehicles for experimentation and, ultimately, the operational phase. All contracts were awarded based on the AFRLs competitive procurement practices. However, there was one exception. 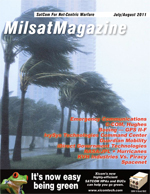 The contract to MicroSat Systems, Inc., was a sole source award. The Minotaur launch vehicle itself was selected as a result of a competitive procurement managed by SMCs Space Development and Test Wing. Amorphous Silicon Solar Arrays for lightweight supplemental power generation, developed by MicroSat Systems, Inc. Approximately two minutes into the flight, the TacSat-2 went silent  the first spacecraft contact found TacSat-2 phoning home exactly as scheduled. However, commands could not be sent to the spacecraft, due to a configuration error at the ground system. This was remedied in two days and all operations went as planned. A final report is being prepared regarding the results and lessons learned from this enlightening project. Data acquisition performed as expected, with information distributed to users via a secure data network that allowed all to share the data with geographically distributed team members. The tactical communications link also performed as expected, however, there are inherent limitations when operating a tactical link with a space asset. Considering all of the needs, a space-based communications network would be most helpful for future tactical space systems. The overall result was that TacSat-2 accomplished much more than was originally envisioned when the program was first conceived. All of the successes, as well as the failures, associated with TacSat-2 are already being leveraged by TacSat-3, -4 and 5. Moreover, the ORS office is ensuring the lessons learned will be employed in the development of future, operational ORS capabilities. As far as cost savings and speed of implementation tempting the Pentagon into additional missions, TacSat-2 is but the first of what is intended to be a string of successful TacSat experiments. TacSat-3 will launch this year, with TacSat-4 to launch in 2009 and TacSat-5 in 2010. Obviously, additional launches would not have been scheduled had TacSat-2 not met, and exceeded, expectations. Sincere congratulations to all who played a role in the program  the ultimate winner will be the warfighter and our nation. In addition to serving as program manager for the successful TacSat-2 mission, Neal Peck also worked for the Air Force Research Laboratory�s Space Vehicles Directorate, Kirtland Air Force Base, N.M., for 10 plus years in a variety of positions, including technology and strategic planner, as well as the Acting Chief, Strategy and Plans Branch. During his 11-year career as an Air Force officer, he was assigned primarily in the space experiments field at Vandenberg Air Force Base, California. This included a tour as the Shuttle Launch Complex operations manager for the $3.3 billion Space Shuttle Launch Complex. Mr. Peck earned a Master of Science degree in Aerospace Engineering from West Coast University, Los Angeles, Calif., and a Bachelor of Science degree in Aeronautical Engineering, Air Force Institute of Technology, Wright-Patterson Air Force Base, Ohio, and another Bachelor of Science degree in Chemistry, Cumberland College, Williamsburg, Kentucky. Leading the TacSat-3 project, Thom Davis also held the same position five years ago for the Experimental Satellite System-10 flight experiment, which represented the first ever microsatellite to successfully demonstrate autonomous navigation and on-orbit proximity operations. Mr. Davis served 22 years in the United States Air Force, retiring as the Acting Director, Space and Missiles Technology, Phillips Laboratory, the predecessor of the Air Force Research Laboratory�s Space Vehicles Directorate, Kirtland Air Force Base, New Mexico. A command pilot with more than 3000 hours of flight experience, Mr. Davis participated in operational assignments flying the HH-3E and UH-1N helicopters, as well as the KC-135 tanker, including a tour with the 89th Military Airlift Wing (Presidential) at Andrews Air Force Base, Maryland. He is also an AIAA Associate Fellow and lifetime member of the Air Force Association, Military Officers Association of America, and the Order of the Dadaelians.